Christina Pasparakis worked as a research associate in the Grosell lab for six months before starting as a Ph.D. student in January 2014. Christina obtained her BSc in Biology and Ecosystems Science and Policy from the University of Miami (2009) and her MSc in Biology with a concentration in Marine Science from San Francisco State University (2013) under the supervision of Anne Todgham. 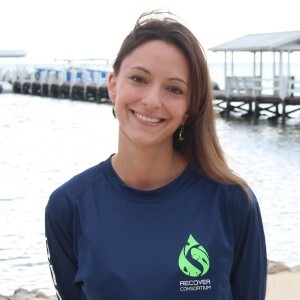 As a research associate, Christina was involved in work related to the Deepwater Horizon Spill and continued this research into her Ph.D. She is currently examining the overall physiology of mahi-mahi (Coryphaena hippurus), along with investigating the sublethal effects of the DWH oil spill on different life stages of this ecologically and economically important species. Aside from the acute mortality of fish elicited by this event, additional sublethal exposures may also have imparted more subtle yet ecologically significant effects that impaired survival due to reduced physiological fitness. Christina hopes to further explore these sublethal effects, such as swim performance and predator-prey interactions during her thesis, to gain a better understanding of the ecological implications of the DWH incident on mahi-mahi.